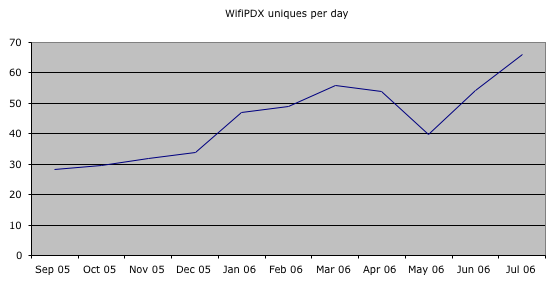 In July, over 2,000 people used my free WiFi site, WifiPDX. This is 20% more people than the previous high (March). It’s small beans to those who follow real Web traffic, but it’s been fun to watch the improvement. From a revenue standpoint, not much is going on for WifiPDX. That’s fine with me, because the chief goal of the site was to connect Portlanders to their neighborhood WiFi. And I helped two thousand people do that last month.